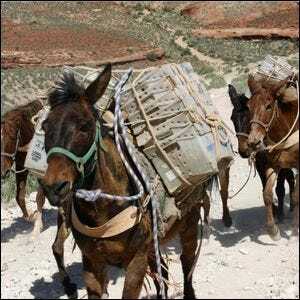 The Only Location In The United States That Still Receives Mail Via Mule Delivery Is In? A Man Was Freed From Jail After Outtakes From Which TV Show Provided Him With An Airtight Alibi? If you thought mail delivery by horseback and mule was a vestige of the 19th century left behind with the expansion of railroads and development of the Wild West into a modern infrastructure type of place, then you thought wrong. Although the vast, vast, majority of mail delivered by the United States Postal Service today is delivered by planes, trains, and automobiles (mostly the squat, boxy Grumman LLV vehicles that are now an ubiquitous sign that a mail delivery person is in your neighborhood), there’s still a place, far out of the way, where the postal workers deliver the mail by saddling up. There is a modest post office that serves the residents of the tiny village of Supai, Arizona, located on the Havasupai Indian Reservation. The Havasupai, numbering a little over 700 people, are one of the smallest tribal nations recognized by the U.S. Federal Government. Their village is so remote that the nearest major shopping facilities are over one hundred miles away. The only ways to get to the village are to fly in via helicopter, hike in on foot, or enlist the help of a hoofed companion and ride in. To deliver the mail to the village—the mail is the primary means of contact the villagers have with the outside world and includes most of their food delivery—postal workers drive the mail sixty miles from the nearest USPS depot to a small outpost where they saddle up a train of mules and take a 16-mile round trip into the Grand Canyon to deliver the post and retrieve packages and letters from the village.